A collection of examples from the Prosthetic Knowledge Tumblr archive on installation artworks which can be characterized by geometric or networked arrangement. Hundreds of spinning blades reveal the invisible patterns of the wind in American artist Charles Sowers’ kinetic installation on the facade of the Randall Museum in San Francisco. The installation, titled Windswept, consists of 612 rotating aluminium weather vanes mounted on an outside wall. As gusts of wind hit the wall, the aluminium blades spin not as one but independently, indicating the localised flow of the wind and the way it interacts with the building. The “Angles Mirror” rejects the idea of building a picture based on relative lightness and darkness. Instead, it explores a system of linear rotation that indicates the direction of an object’s contour. A wall-mounted sculpture, the “Angles Mirror” is a sharp triangular block of steel, dotted with yellow indicator arms that pivot. Based on the isometric grid, its structure favors the patterns and angles found in an equilateral triangle. The arms, which do not have the ability to change brightness or luminosity, use input from a camera and reconstruct the view with areas of varying angles. The negative space surrounding a viewer is translated into horizontal lines on the picture plane. Rather than creating a photorealistic image, the three-dimensional movement of a figure is represented, visualizing optical flow as viewer’s proximity to the sculpture changes. A nuanced contour results, as the viewer shifts back and forth, altering how the structure of space is perceived. Similar to “Fan Mirror”, in the “Angles Mirror”, the sequence of movement across the picture plane is directed in part by its audience. When the viewer walks away from the work, or chooses to view the sculpture from a distance, a series of predefined images and transitions cover the object’s surface. Interactive installation is grid of transparent LCDs which display halftone and circular patterns whose display can emulate it’s viewers. Created by Korena collective HYBE, IRIS is a media canvas with matrix of conventional information display technology, that is a monochrome LCD.Through the phased opening and closing of circular black liquid crystal, IRIS can create various patterns and control the amount (size) of passing lights. Installation features 80 wall-mounted teddy bears, all recounting emotional messages posted on the internet with artificial voices. TED is a large, wall-based installation consisting of an array of 80 Teddy Ruxpin dolls that speak emotional content gathered from the web via synthetic speech with animated mouths. The speaking of the emotional content is accompanied by one of twenty-four musical vignettes that have been paired to the emotional content being spoken. Each vignette, representing one of twenty-four subtle variants of human emotion, have been composed in such a way that the beginnings and ends of the short pieces will seamlessly dogleg in any possible configuration and stream endlessly as a unified whole. The installation is allowed to drift about freely through the emotional landscape being driven only by those who are contributing content to the piece whether unwittingly or consciously. As such the overall presentation of the piece can vary greatly based on external conditions such as seasons, world events and even time of day. The piece is essentially taking the instantaneous emotional pulse of the internet and this collective pulse, like a human pulse, varies over time. Mechanical installation is a wireframe form which adjusts it’s shape according to a weather data feed. 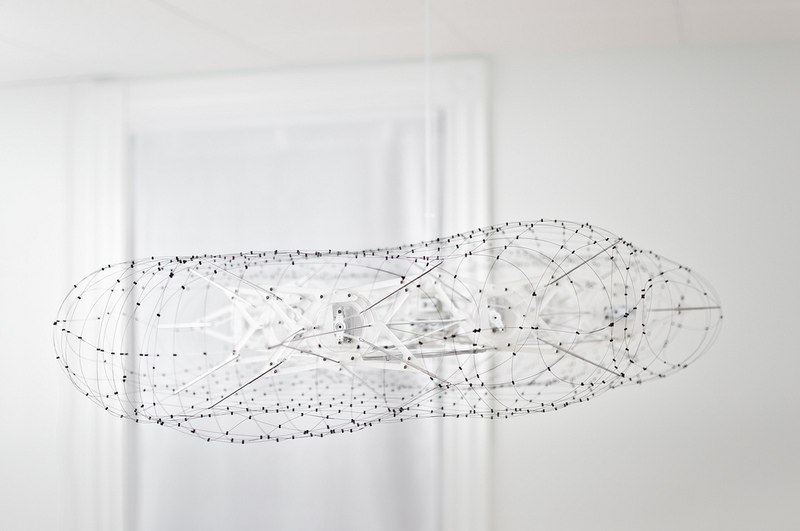 Point Cloud is an attempt to reimagine our daily interaction with weather data. Weather has always had a unique place in our lives, because it has a multiplicity that encompasses both the concrete and the indeterminate. It is the intangible context within which we build our lives and our cities, but it is also the physical element against which we create protective shelter. Most of the time it is an invisible network that we can see but are not aware of; yet it can manifest in a spectacle or disaster, come forward and activate our senses, make us forget our rationality in delight or fear. With modern scientific and technological developments, we can now deploy sophisticated monitoring devices to document and observe weather. Yet despite these advances, our analysis and understanding of meteorology is still largely approximate, and in many cases, inaccurate. Weather continues surprise us and elude our best attempts to predict, control, and harness the various elements.